Let’s re-look at our past ten infographic highlights for the Indian CRE Market. Top 7 CRE markets in India recorded leasing activity of 26 msf in the first half of 2017 compared to 24.5 msf during the same time last year. Gross Absorption for Chennai and Noida more than doubled in H1 2017 compared to H1 2016. Hyderabad also witnessed a sizeable growth in leasing activity in H1 2017 compared to the same period last year. Whilst Mumbai maintained similar absorption levels compared to last year in the first six months of 2017, Bangalore, Pune and Gurgaon saw a decline during the period in y-o-y comparison. The top 3 cities in South India will witness cumulative lease expiries of 9.7 msf.Bangalore will contribute to more than 2/3rd of these lease expiries. Since these cities are dominated by IT-ITeS occupiers, predominantly occupying large spaces, deals above 1 lakh sf will form 43.5% of the total lease expiry volume. The office construction completions slows in HY1 2017, with 6.7 msf delivered across cities, down by 48% compared to H1 2016. With the recent news, 20-acre IT Park to be built in Chennai by Hiranandani Group, the city is on its way of being the next IT hub of the country. Strong leasing activity has fueled the absorption in Chennai IT parks, contributing more than fifty percent of the total. The vacancy in IT park, continued to fall, ending HY1 2017 at 6 percent. Occupiers across cities prefer taking up office spaces in SBDs and PBDs. The transition is driven by occupiers demand for affordable rents, Grade A offices, expansion space and transit-served markets. Propstack analysed > 25,000 sf deals in 2017. SBDs outshine CBDs. The demand for a furnished plug and play office space in Mumbai is increasing steadily, average rentals for the furnished offices have however declined. 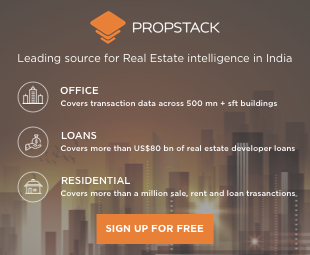 Propstack observed that the number of furnished transactions increased by average 16% y-o-y, whereas the rentals have decreased by average 4%. A CAM (Common Area Maintenance) charge is an additional cost, added to the base rent, paid collectively for the maintenance of the commonly owned premises such as the parking lot, lawns, corridors, lobbies, elevators, etc. Propstack compared CAM fee across top cities in India to assess the micromarkets with highest CAM fee. Rest of Gurgaon micromarket has the highest CAM at Rs 21 psf / month. Pune office rentals have been on an upswing due to limited availability coupled with steady demand for quality office space. Therefore Pune’s office average yield is increasing every year. Propstack analyzed the rent-yielding micromarkets. PBD west offers the highest yield for prime office space. In 2017, the office leasing activity in Bangalore remained strong and maintained its momentum. 100000+sf deals contributed to nearly 79% of the total Gross absorption. Nearly 84% of the total 100,000+sf transactions are New Leases. Hyderabad office supply in SBD II micromarket increased significantly. Strong leasing activity and entry of multinational giants, absorbed the new supply, keeping vacancy low for IT SEZ buildings.